What can research in psychology and neuroscience tell us about talent development? 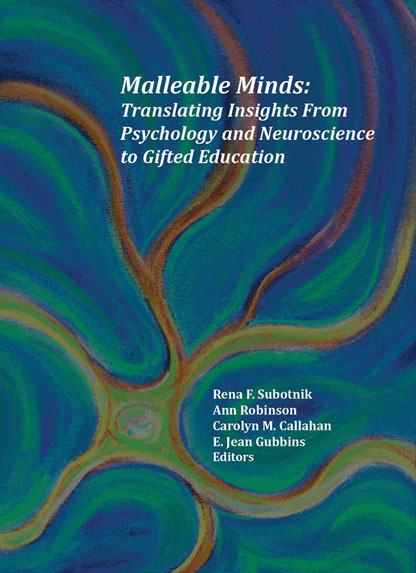 This illuminating volume from The American Psychological Association, the National Association for the Gifted and Talented, and The National Research Center on the Gifted and Talented offers insights from social and cognitive psychologists and cognitive neuroscientists as they share and connect their research findings and perspectives with experts in gifted and talented education. Collectively, the scholars offer an intriguing discussion of how their research might support the optimal performance of gifted and talented individuals, and inform the quality of services they must receive to do so. The volume is divided into three sections. In Section I, researchers and scholars discuss significant findings from their studies in social and cognitive psychology and cognitive neuroscience to further help us understand how talent develops. The work of scholars such as Carol Dweck’s findings on motivation and Joshua Aronson’s findings on stereotype threat become cornerstone research pieces integrated throughout the volume. Next, the scholars in Section II discuss how research in psychology and neuroscience can inform theory and practice in gifted education. Finally, the authors in Section III provide cases to demonstrate the direct applicability of the research presented. Malleable Minds: Translating Insights From Psychology and Neuroscience to Gifted Education offers researchers, scholars, practitioners, and other interested individuals cutting-edge research that may be expounded on and immediately implemented in the classroom to positively affect teaching and learning in a variety of fields. To order a copy of the Malleable Minds book, download the order form and mail to us with your payment.